There’s a shortage of houses in Amsterdam — a city ‘everyone and his mother’ wants to move to. As a result, there is a shortage of affordable houses as well. Students often end up paying for one small room as much or more than someone long-established residents pay for an entire apartment. One solution the city has come up with is to provide temporary, affordable student accommodation at various sites throughout the city. How? Buy converting shipping containers into full-blown apartments, complete with a bedroom, kitchen, living room, a shower, and a high-speed internet connection. 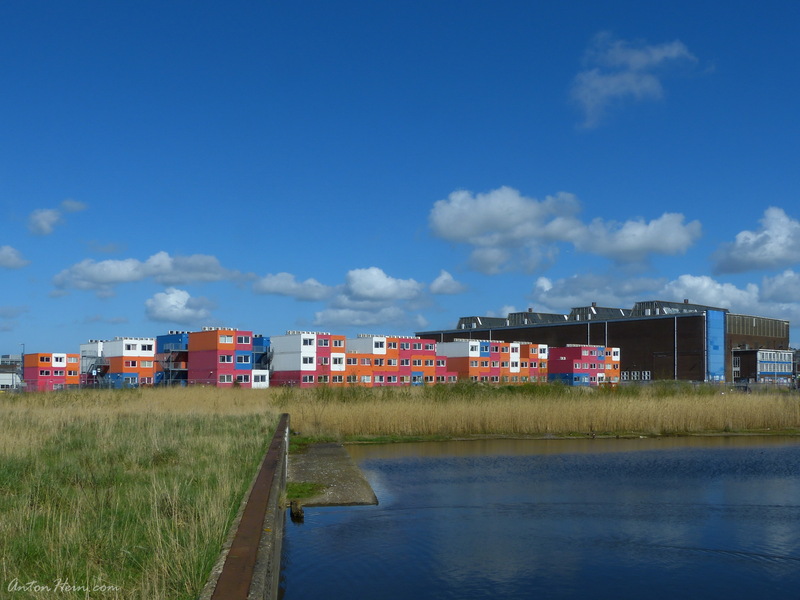 Shown above are the student container apartments on the grounds of the NDSM, a former shipyard located on the river IJ (pronounced somewhat like ‘eye’). These are surprisingly comfortable apartments, in a fantastic locations. Students love them. The larger building on the right is the erstwhile welding hangar. Currently various property development companies are in the process of building regular apartment buildings for students. Once there are enough houses to accommodate all students, sites like these will disappear. After all, IJ-side property is premium property.